’Time is Brain’. Acute Stroke is a medical emergency. Stroke is a major cause of death and disability, and patient outcomes depend on how quickly the blood flow can be restored to the damaged area of the brain. Stroke scales are standardized assessment tools used to identify Stroke and clear a path to reperfusion. Treatment options for stroke include thrombolytic medications that aim to dissolve the clot, and interventional endovascular procedures (similar to a cardiac catheterization) to remove it. Successful stroke care requires early recognition, transporting the patient to a designated stroke center, and early activation of a stroke team at the hospital. In addition to their importance for assessing the impact of therapeutic interventions in clinical trials, stroke scales are useful in the routine clinical setting as aids to improve diagnostic accuracy, help determine the appropriateness of specific treatments, monitor a patient's neurologic deficits through the continuum of care, and predict and gauge outcomes. Not only are different types of scales needed for these different purposes, but no single scale is suitable for capturing all of the effects of stroke. Emergency Medical Services (EMS) provide the first medical contact for upto 70% of all stroke patients, and are therefore in a unique position to reduce delays in presentation and treatment. Reliable identification of stroke patients in the field could decrease delays by permitting paramedics to notify receiving hospitals of the imminent arrival of a stroke case ensuring rapid rapid mobilisation of stroke teams and early access to required scanning on hospital arrival. Pre Hospital assessment and determination of stroke severity is a new concept, with the best scale yet to be determined. The Cincinnati and Los Angeles scales have been validated in hospital trials, but studies are mixed when applied by EMS . The RACE Scale has had some positive results when tested among paramedics in Spain with more studies underway , currently it is being adopted by many EMS Systems in the United States. Developed in 1997 at the University of Cincinnati Medical Center for pre-hospital use the Cincinnati Pre-Hospital Stroke Scale (CPSS) was derived from the National Institutes of Health Stroke Scale . The CPSS is used to diagnose a potential stroke in a pre-hospital setting through testing the following three signs . If any one of these tests show abnormal findings, the patient may be having a stroke and should be transported to a hospital as soon as possible. Patients with 1 of these 3 findings as a new event have a 72% probability of an ischemic stroke, while if all 3 findings are present the probability of an acute stroke is greater than 85% . FAST was developed in the UK in 1998 by a group of stroke physicians, ambulance personnel, and an emergency room physician and was designed to be an integral part of a training package for ambulance staff. The FAST was derived following a review of existing stroke identification instruments including the Cincinnati Prehospital Stroke Scale (CPSS) and the Los Angeles Prehospital Stroke Screen (LAPSS). FAST was created to expedite administration of intravenous tissue plasminogen activator to patients within 3 hours of acute stroke symptom onset. 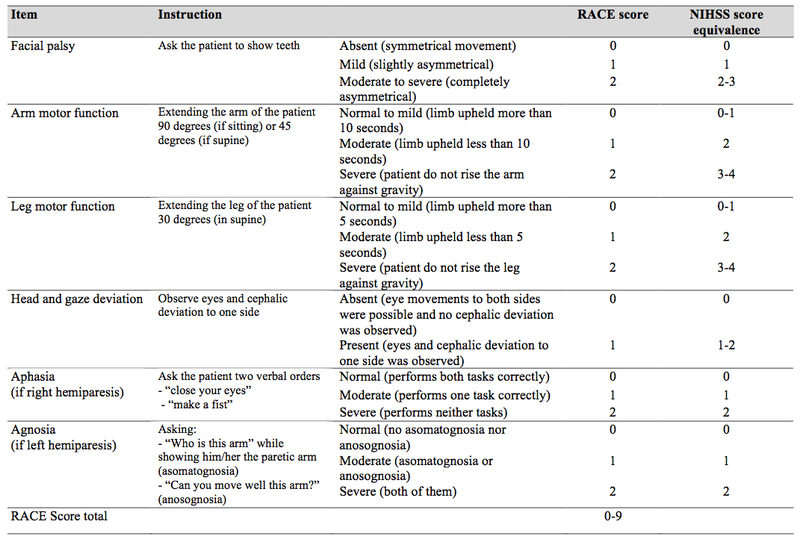 During the development of FAST Scale, emphasis was placed on producing a simple test that would complement existing assessments used by UK paramedics, such as the Glasgow Coma Scale. 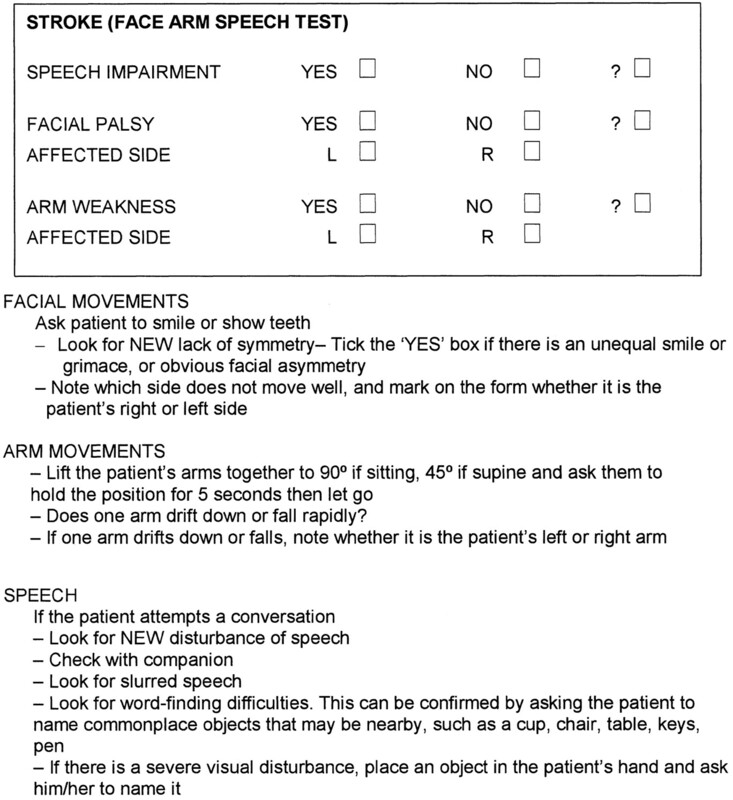 FAST contains 3 key elements from the CPSS ((Facial Weakness, Arm Weakness, and Speech Disturbance) but avoids the need to repeat a sentence as a measure of speech, instead using assessment of language ability by the paramedic during normal conversation with the patient. The 3 assessments contained within the FAST were incorporated into the standard ambulance report form used for recording all ambulance contacts within the UK . The FAST Test is now used in many countries as a Campaign for to help the public achieve a better understanding of the warning signs of stroke, ensuring that individuals get the medical assistance they need quicker. The Los Angeles Prehospital Stroke Screen (LAPSS) is a longer and widely used validated screening tool for early identification of stroke by Emergency Medical Technicians / Paramedics. The LAPSS showed a Sensitivity of 91%, Specificity of 97% with Positive Predictive Value of 86% and Negative Predictive Value of 97% following a Prospective Study In Field Validation Study with 19 UCLA Paramedic Crews, who following a 60-min Training Session . If Items 1 - 6 below are all Yes's or Items 5 - 7 Unknown then LAPSS Screening Criteria is met. Note: the patient may still be experienceing a Stroke even if LAPSS Criteria are not met. 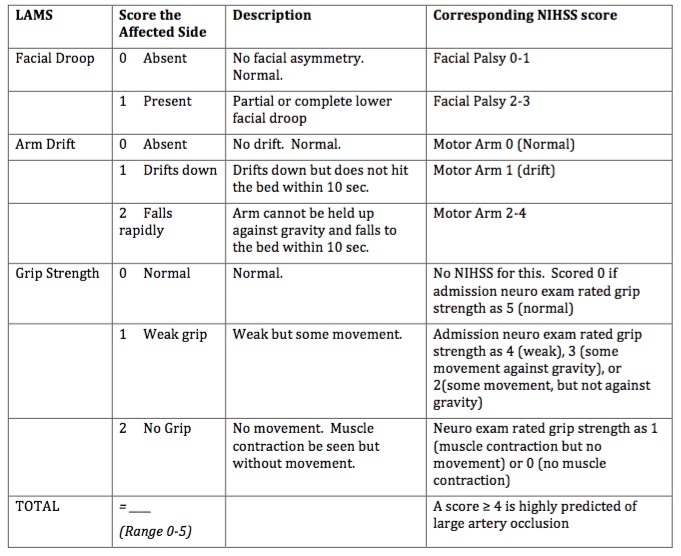 The Los Angeles Motor Scale (LAMS) is a brief 3-item stroke severity assessment measure designed for prehospital and Emergency Department use, derived from the Los Angeles Prehospital Stroke Screen which quantitatively characterizes stroke severity in the field, and predicts functional outcomes with accuracy nearly comparable to that of the full NIHSS. The Los Angeles Motor Scale (LAMS) was constructed by assigning point values to LAPSS items of Facial Weakness (0,1), Arm Strength (0,1,2) and Grip (0,1,2) to yield a total 0–5 Scale . A motor score derived from the LAMS rapidly quantifies stroke severity in the field and predicts functional outcomes with accuracy comparable to that of the full NIHSS and the sNIHSS . A score ≥ 4 is highly predicted of large artery occlusion . Compared with other instruments proposed for prehospital stroke severity assessment the LAMS has advantages of greater simplicity, more rapid administration, and of being immediately derivable from a validated stroke recognition instrument, rather than requiring separate examinations for stroke diagnosis and stroke severity assessment . Performing the LAMS is a good strategy to identify stroke patients in the field, assess their severity, and determine the likelihood that they are candidates for endovascular therapies. Where those with a LAMS score of ≥4, prearrival notification could accelerate endovascular interventions by permitting early mobilization of the endovascular team and readying of the angiographic suite. The Rapid Arterial oCclusion Evaluation (RACE) Scale is the most recent scale developed and was designed based on the National Institutes of Health Stroke Scale (NIHSS) to accurately assess stroke severity and identify patients with acute stroke with large artery occlusion at prehospital setting by medical emergency technicians who may be candidates to be treated with endovascular techniques in a comprehensive stroke center. The RACE Scale takes slightly more time to perform than the CPSS and the LAPSS with the goal of the scale to more accurately identify Stroke Severity and localise the area affected . The RACE scale is a simplification of the NIHSS scale using those items with a higher ability to predict the presence of a large vessel occlusion. It evaluates 5 items: Facial Palsy, Brachial Paresis, Crural Paresis, Oculocephalic Deviation and Aphasia/Agnosia, with a total score of 0-9. Based on the RACE Scale a Stroke is likely with a score above 1 and an Emergent Large Vessel Occlusion is likely if the cumulative score is > 4 with a sensitivity of 85% and specificity of 69%. 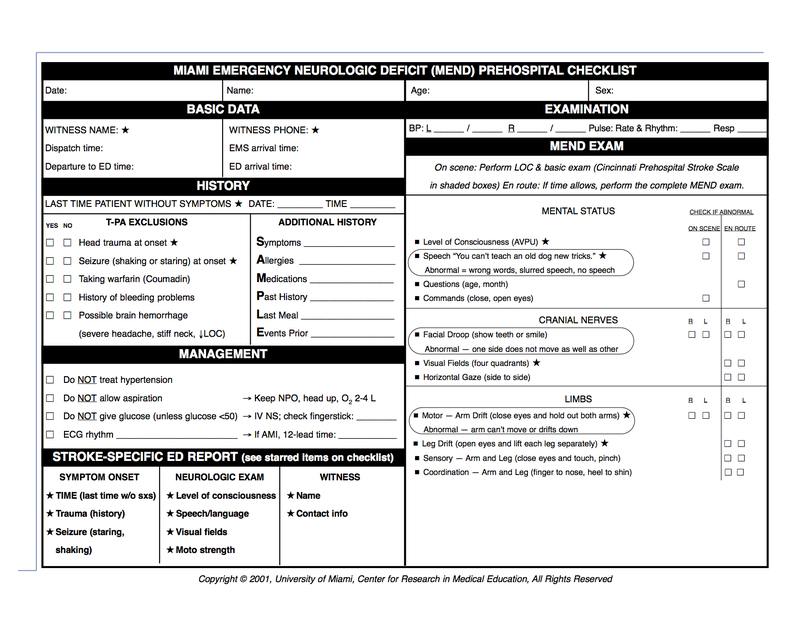 The Miami Emergency Neurologic Deficit (MEND) is an easy-to-learn, easy-to-use checklist that provides key information which incorporates the three components of the Cincinnati Prehospital Stroke Scale (CPSS) as well as additional components from the NIH Stroke Scale (NIHSS). The MEND was devised to facilitate communication between healthcare providers throughout the continuum of care for stroke patients as it can be used to obtain a baseline exam in the prehospital setting and then for initial evaluation and subsequent exams in the emergency department or ICU. It is more thorough than the CPSS but takes less than 3 minutes to perform and requires no additional tools. in the prehospital setting is that the CPSS be performed on scene and the MEND exam be performed en route, to minimize transport delays. The ABCD / ABCD2 can be used to predict the risk of stroke during the first seven days after having a Transient Ischemic Attack (TIA). Researchers found there to be over 30% risk of stroke in TIA patients with an 'ABCD score' of six, as compared to no strokes in those with a low ABCD score. Can be used in routine clinical practice to identify high-risk individuals who require emergency investigation and treatment. The ABCD2 score was created by merging two previously validated clinical decision rules - the ABCD and the California scores. The ABCD score was created to estimate the 7-day risk of stroke following a TIA, while the California score predicted the 90-day risk.The ABCD2 score is a validated, seven-point, risk-stratification tool to identify patients at high risk of stroke following a TIA. Patients with scores ≥4 are at considerably higher risk of stroke in the 2-day period following a TIA, and may potentially require urgent intervention as inpatients. Main role to measure deficits and stroke severity, which predicts patient discharge disposition. It provides a Standardized Neurological Exam, that can be utilised to monitor Neurological Status and can also be used to match patients to allow for comparison in clinical trials. The National Institutes of Health Stroke Scale (NHISS), considered the Gold Standard Acute Stroke Assessment, is a systematic assessment tool that provides a quantitative measure of stroke-related neurologic deficit. The NIHSS was originally designed as a research tool to measure baseline data on patients in acute stroke clinical trials. Now, the scale is also widely used as a clinical assessment tool to evaluate acuity of stroke patients, determine appropriate treatment, and predict patient outcome. The NIHSS can be used as a clinical stroke assessment tool to evaluate and document neurological status in acute stroke patients. The stroke scale is valid for predicting lesion size and can serve as a measure of stroke severity. The NIHSS has been shown to be a predictor of both short and long term outcome of stroke patients. Additionally, the stroke scale serves as a data collection tool for planning patient care and provides a common language for information exchanges among healthcare providers. The scale is designed to be a simple, valid, and reliable tool that can be administered at the bedside consistently by physicians, nurses or therapists. Read more about the NIHSS. The National Institutes of Health Stroke Scale (NIHSS) is the first choice among stroke scales. The Scandinavian Stroke Scale (SSS) is an alternative stroke scale, that is to apply in clinic, frequently used in Scandinavian countries and has recently also been validated in the Portuguese language . Inter-rater reliability of the items varies from excellent for conscious level, orientation and gait, to moderate for facial palsy . Neurological recovery, as measured by the SSS change score during the first week after onset of stroke, was shown to be an independent predictor of good functional outcome . The advantage of the SSS is its simplicity, which makes it easy to perform repeated measures in the very acute phase after stroke. In a 2016 prospective study including patients with acute stroke the SSS was as good as the NIHSS in identifying patients who had died or were dependent at 3-month follow-up . According to Askim et al (2016) although the measurement properties of the NIHSS and the SSS are equal in their ability to identify outcome, the superiority of the SSS lies with its simplicity and ease of use in the clinic. An example is the difference in measuring motor function between the two scales. While in the NIHSS patients are asked to keep their limb against gravity for 10 s, which means that you need a watch, in the SSS patients must keep their limb against manual resistance to get a full score. This advantage of the SSS is of particular importance when repeated measures of selected items are used to detect early neurological deterioration . One of the first scales developed to assess stroke patients, the Canadian Neurological Scale (CNS) developed in 1986 as a simple tool to be used in the evaluation and monitoring of neurological status of patients with stroke in the acute phase and is a validated score to assess stroke severity . Lower scores indicate greater stroke severity. The CNS evaluates 10 clinical domains, including mentation (level of conciousness, orientation and speech) and motor function (face, arm and leg). Previous studies showed good to excellent interrater agreement  . The CNS has been found to be brief, valid and reliable, and can be administered in approximately five minutes  but should not be used for the unconscious/stuporous patient .The CNS can also be reliably converted to the NIHSS using a simple conversion formula: NIHSS = 23 - 2 x CNS. This finding may have a practical impact by permitting reliable comparisons with NIHSS-based evaluations and simplifying the routine assessment of acute-stroke patients in more diverse settings . The CNS can be accessed here. The European Stroke Scale (ESS), which consists of 14 items selected for their specificity and their prognostic value, was designed specificallyfor clinical stroke trials in patients with middle cerebral artery stroke . This scale can be used as an instrument for matching of treatment groups as well as for evaluation of the patient's level of impairment. The scale consists of 14 items selected on the basis of their specificity and their prognostic value. The 14 items are level of consciousness, comprehension, speech, visual field, gaze, facial movement, maintainence of arm position, arm raising, wrist extension, finger strength, maintainence of leg position, leg flexing, foot dorsiflexion, and gait. Because gait is part of the standard clinical neurological evaluation and can be considered as a mixture of different prognostic levels of impairments (ie, proximal and distal motor function of the leg, postural control), this item was included in the scale . This scale is heavily weighted toward motor function. The scale is reliable, sensitive, and easy to use and has prognostic value for outcome. Its concurrent validity was tested in terms of correlation with other neurological scales and with a motor, functional, and handicap scale. The ESS can be used to assess a patient who has recently had a stroke involving the distribution of a middle cerebral artery. This can be used to measure therapeutic efficacy and to match patients for comparison. Pre-hospital and Acute Scales focus more on impairments such as hemi-paresis, consciousness, gaze deviation, muscle tone, reflex abnormalities, and intellectual function which in teh acute phase is important to assist with diagnosis and prognosis. During the rehabilitation phase and more chronic chronic phase of stroke, these types of measurement tend to be less important as the focus turns more to performance in functional tasks. For a patient, the most important aspect of his disease is not the specific level of imparment e.g. grade of hemiparesis but more on their ability to perform daily activities and to fulfil social roles. As highlighted by Harrison et al (2013) as stroke is an exemplar disabling long-term condition, measures of function are well suited as outcome assessment . Functional assessment scales are utilised to give a numerical value to abstract concepts such as “disability,” they can be used to objectively quantify deficits and track change over time. This can be particularly useful in a rehabilitation setting. The following Physiopedia Page outlines a selection of outcome measures that provides the best available information on how outcome measures might be classified and selected for use, based upon their measurement qualities Stroke Outcome Measures Overview. There are many scoring systems to screen for an acute ischemic stroke in the field. EMS groups most commonly use Face Arm Speech Test (FAST), Cincinnati Prehospital Stroke Scale (CPSS), or Los Angeles Prehospital Stroke Screen (LAPSS). Many of the more commonly used stroke scales are not designed to identify posterior circulation strokes . The most common scale used in the hospital setting is the NIHSS. For prehospital assessment, the shortened version was developed, including assessment of gaze, visual field, motor function of the right and left leg, language, level of consciousness, facial paresis, and dysarthria. It attempts to predict stroke severity but is more complicated than some of the other stroke scales. With its complexity, it can evaluate strokes outside of the middle cerebral artery distribution. A stroke scale should be used in the prehospital setting for any patient with an acute neurological deficit to rapidly assess and triage patients with possible stroke . There is currently no practical prehospital scale that accurately detects strokes outside of the middle cerebral artery distribution . CPSS and LAPSS are the most validated and most frequently used scales . The World Health Organization’s International Classification of Functioning, Disability and Health (WHO-ICF) gives a conceptual framework that can aid classification of the Stroke Assessment Scales in order to decide on the appropriate measure fot specific functional assessment. The ICF as a framework to approach patient care that shifts the conceptual emphasis away from negative connotations such as disability and places focus on the positive abilities of the individual at the patient level rather than the systems level. The ICF framework is a classiﬁcation of the health components of functioning and disability and focuses on 3 perspectives: body, individual, and societal. These 3 perspectives underscore the importance of the interplay and inﬂuence of both internal and external factors to each individual’s condition of health. Many assessment tools, spanning various functional domains, are available to clinicians and researchers working with stroke survivors. ↑ Asimos AW, Ward S, Brice JH, Rosamond WD, Godstein LB, Studnek J. Out-of-hospital stroke screen accuracy in a state with an emergency medical services protocol for routing patients to acute stroke centers. Annals of Emergency Medicine, 2014; 64 (5) 509-515. ↑ 3.0 3.1 Hurwitz AS, Brice JH, Overby BA, Evenson KR. 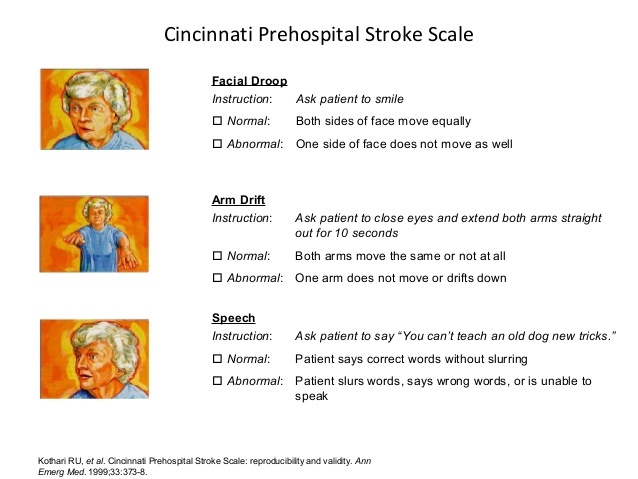 Directed use of the Cincinnati Prehospital Stroke Scale by laypersons. Prehospital Emergency Care. 2005 Jan 1;9(3):292-6. ↑ Kothari, R.; Hall, K.; Brott, T.; Broderick, J. (1997-10-01). "Early stroke recognition: developing an out-of-hospital NIH Stroke Scale". Academic Emergency Medicine. 4 (10): 986–990. ISSN 1069-6563. PMID 9332632. ↑ American Heart Association (2011). Advanced Cardiovascular Life Support Provider Manual. USA: First American Heart Association Printing. p. 137. ISBN 978-1-61669-010-6. ↑ Harbison J, Hossain O, Jenkinson D, Davis J, Louw SJ, Ford GA. Diagnostic accuracy of stroke referrals from primary care, emergency room physicians, and ambulance staff using the face arm speech test. Stroke. 2003 Jan 1;34(1):71-6. ↑ Kidwell CS, Starkman S, Eckstein M, Weems K, Saver JL. Identifying stroke in the field: prospective validation of the Los Angeles Prehospital Stroke Screen (LAPSS) Stroke. 2000; 31 (1): 71–76. doi: 10.1161/01. STR.;31:71. ↑ Chen S, Sun H, Lei Y, Gao D, Wang Y, Wang Y, Zhou Y, Wang A, Wang W, Zhao X. Validation of the Los Angeles pre-hospital stroke screen (LAPSS) in a Chinese urban emergency medical service population. PLoS One. 2013 Aug 7;8(8):e70742. ↑ Llanes JN, Starkman S, Kidwell CS, Eckstein M, Saver JL. The LAPSS Motor Scale (LAMS): a new measure for characterizing stroke severity in the field. ↑ Llanes JN, Kidwell CS, Starkman S, Leary MC, Eckstein M, Saver JL. The Los Angeles Motor Scale (LAMS): a new measure to characterize stroke severity in the field. Prehospital Emergency Care. 2004 Jan 1;8(1):46-50. ↑ 12.0 12.1 Nazliel B, Starkman S, Liebeskind DS, Ovbiagele B, Kim D, Sanossian N, Ali L, Buck B, Villablanca P, Vinuela F, Duckwiler G. A brief prehospital stroke severity scale identifies ischemic stroke patients harboring persisting large arterial occlusions. Stroke. 2008 Aug 1;39(8):2264-7. ↑ de la Ossa NP, Carrera D, Gorchs M, Querol M, Millán M, Gomis M, Dorado L, López-Cancio E, Hernández-Pérez M, Chicharro V, Escalada X. Design and Validation of a Prehospital Stroke Scale to Predict Large Arterial Occlusion. Stroke. 2014 Jan 1;45(1):87-91. ↑ de la Ossa NP, Ribó M, Jiménez X, Abilleira S. Prehospital Scales to Identify Patients With Large Vessel Occlusion. Stroke. 2016 Nov 1;47(11):2877-8. ↑ Spilker J1, Kongable G, Barch C, Braimah J, Brattina P, Daley S, Donnarumma R, Rapp K, Sailor S. Using the NIH Stroke Scale to assess stroke patients. The NINDS rt-PA Stroke Study Group. J Neurosci Nurs. 1997 Dec;29(6):384-92. ↑ Brott, T., Adams, H. P., Jr., et al. (1989). 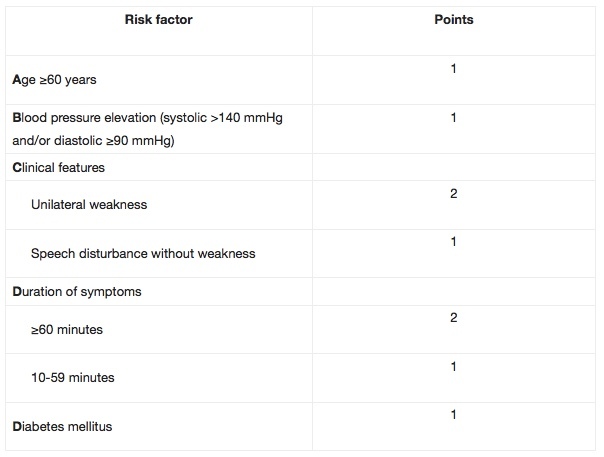 "Measurements of acute cerebral infarction: a clinical examination scale." Stroke 20(7): 864-870. ↑ 18.0 18.1 Luvizutto GJ, Monteiro TA, Braga G, Pontes-Neto OM, de Lima Resende LA, Bazan R. Validation of the Scandinavian Stroke Scale in a multicultural population in Brazil. Cerebrovasc Dis Extra 2012; 2: 121–126. ↑ 19.0 19.1 19.2 Askim T, Bernhardt J, Churilov L, Indredavik B. The Scandinavian Stroke Scale is equally as good as The National Institutes of Health Stroke Scale in identifying 3-month outcome. Journal of Rehabilitation Medicine. 2016 Nov 5;48(10):909-12. ↑ Cote R, Hachinski VC, Shurvell BL, Norris JW, Wolfson C. The Canadian Neurological Scale: a preliminary study in acute stroke. Stroke. 1986 Jul 1;17(4):731-7. ↑ Cote R, Battista RN, Wolfson C, Boucher J, Adam J, Hachinski V. The Canadian neurological scale validation and reliability assessment. Neurology. 1989 May 1;39(5):638-. ↑ Duncan PW, Lai SM, Van Culin V, Huang L, Clausen D, Wallace D. Development of a comprehensive assessment toolbox for stroke. Clinics in geriatric medicine. 1999 Nov;15(4):885-915. ↑ MacKay M, Legg K, Nearing S. Neurological assessment of the stroke patient: The Canadian Neurological Scale. Heart. 2007;885:915. ↑ Nilanont Y, Komoltri C, Saposnik G, Côté R, Di Legge S, Jin Y, Prayoonwiwat N, Poungvarin N, Hachinski V. The Canadian Neurological Scale and the NIHSS: development and validation of a simple conversion model. Cerebrovascular diseases. 2010 May 22;30(2):120-6. ↑ 26.0 26.1 Hantson L, De Weerdt W, De Keyser J, Diener HC, Franke C, Palm R, Van Orshoven M, Schoonderwalt H, De Klippel N, Herroelen L. The European Stroke Scale. Stroke. 1994 Nov 1;25(11):2215-9. ↑ Harrison JK, McArthur KS, Quinn TJ. Assessment scales in stroke: clinimetric and clinical considerations. ↑ 28.0 28.1 28.2 28.3 28.4 Glober NK, Sporer KA, Guluma KZ, Serra JP, Barger JA, Brown JF, Gilbert GH, Koenig KL, Rudnick EM, Salvucci AA. Acute stroke: current evidence-based recommendations for prehospital care. Western Journal of Emergency Medicine. 2016 Mar;17(2):104.